In Germany, UFOP reports that following China’s ban on U.S. soybeans, the U.S. has been in need of new buyers. 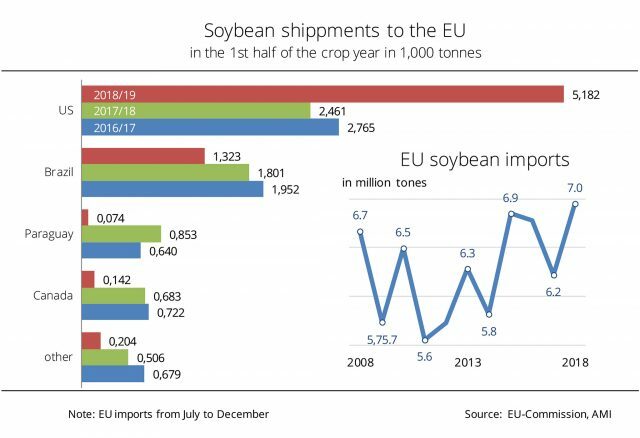 The EU-28 benefits from this situation as its imports of US soybeans have multiplied. The prime reason for the strong rise in shipments from the US is the trade war between the US and China, according to UFOP. In response to the import tariffs the US unilaterally imposed on Chinese products, China imposed tariffs on US soybean imports.